Carpenter Ants are one of the largest ants we have in the Seattle king county washington.Getting rid of carpenter ants requires the knowledge of experienced ant exterminator. Typically you’ll know you have carpenter ants because you’ll start noticing large, black ants foraging randomly on or around the home. The larger and smaller Black Carpenter Ant have a wide range of colors including yellow, red, light to dark brown and black. 1) Scent trails which may be hundreds of feet in length (expect to see only a few ants on this trail at any given moment). 2) Nocturnal activity (mostly active at night). 3) Chewing on wood structures and in wall or ceiling voids for nesting. 4) An ability to identify leaky, damp wood and spaces. 5) An ability to avoid chemically treated areas and find new ways into a structure. Carpenter Ants typically set up a series of nests which are all “linked” together. This network of nests can be in series enabling foraging workers and scouts to have a place of safe haven when out and about doing their chores. This structure also helps to preserve any one colony because it’s rare that all the members will ever be in one location at one time. Should any one “satellite” nest be destroyed, the other nests will usually have enough members left to enable the colony to move on and survive. This is also why controlling carpenter ants can sometimes be a difficult job. If you only get 1-2 of their nests but miss even one satellite colony, they might be able to rebound and rebuild. This is why a thorough and complete treatment by a professional experienced pest control company is needed when implementing a carpenter ant program. Carpenter Ants are a problem when they forage into your home. You may see only one or two foraging around for food sources, that means you have a nest or scent trail which needs attention. 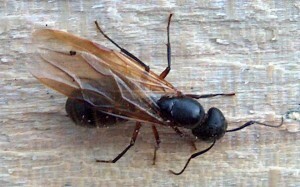 Another sign you have a carpenter ant infestation is if you happen to find a lot of large black ants with wings. Like most ants, carpenter ants generate “swarmers”, or winged reproductives, whose sole purpose is to leave an existing nest to fly away and land somewhere to start a new nest. These swarmers tend to be released during the spring but may be found at any time. If you are finding these in the home or commercial building, chances are there is a nest located somewhere on the structure. From this nest the ants could invade several homes and cause all kinds of structural damage. 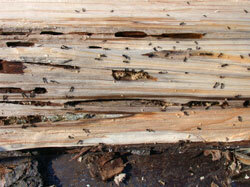 More importantly, if left untreated, these carpenter ants would undoubtedly create many more nests. Watch carefully and you’ll be able to see some swarmers, the ones with wings, as well as all different sized workers. If you know where a nest might be located, a direct treatment should be done. 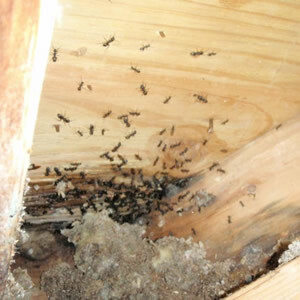 Getting rid of carpenter ants where they nest is very effective and should be done when possible. The key here is knowing where the nest is located. This can be tricky. Carpenter ant Treatment inside… Although you are compelled to spray something in the home, doesn’t mean Spraying will work.Most spray treatment are designed to kill on contact. Common carpenter ant nest sights include the dishwasher, under cabinets, around pipes, attics, leaky windows, leaky roofs, leaky doors, wall voids and garage door jams. If you are not sure where the nest is, baiting the inside of your home or building is much more effective. Carpenter ant Perimeter treatments… This is the area immediately adjacent to the structure. If you are not treating this area on a regular basis, reconsider. Monthly or quarterly treatments on the outside of your building will get rid of carpenter ants that are foraging and in effect, provide long term carpenter ant control. Carpenter ant Yard treatment… This area may be the reason your building is having a problem in the first place. If general pests are ignored and allowed to exist on common ground, they will find their way into your buildings. This is especially true with Carpenter Ants because they forage further than most ground walking insect. Inspect trees, pine islands, old wood piles, decks, stumps, wooded lots, fences and adjacent buildings. The best method to control carpenter ants is to locate and destroy the nest, replace damaged or decayed wood, and, if they exist, eliminate moisture problems. by an experienced professional carpenter ant exterminator. electrical wiring to avoid giving carpenter ants easy access to your home. Note: For information on pruning large, established trees see Pruning Trees and Shrubs. treatments can cost about $250 per year by professional exterminator.